As you may have heard around these parts lately, Matt and I are trying to eat better all across the board. One such area is simply trying to eat less carbs. Hence the bunless burgers. These were as delicious as they look and I didn't even miss the bun! And it has been forever and a day since I've shared one of my chef's creations! 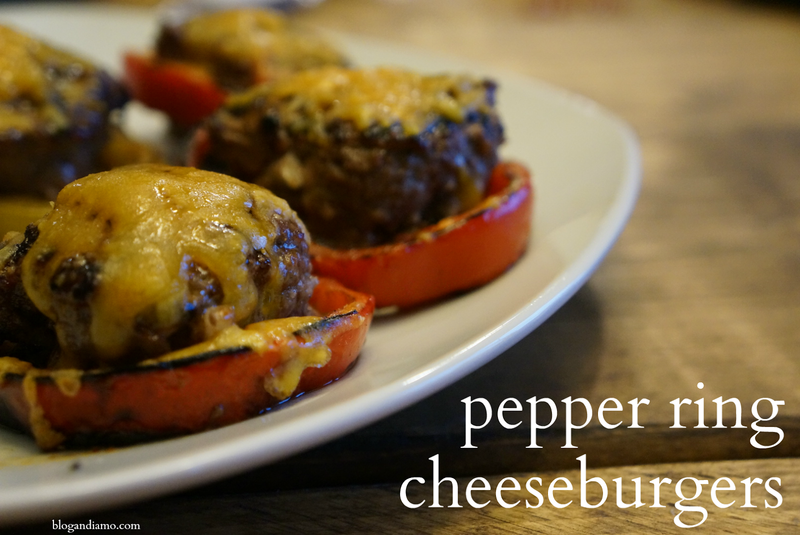 We had these with roasted sweet potatoes, cauliflower and broccoli, but they would be great with any manner of sides, just like burgers with their buns! Mix together the ground beef or turkey with the onion, garlic, chopped pepper tops, season salt, pepper, Worcestershire Sauce until incorporated. Separate out meat into 6 portions. Take pepper ring and press meat into the middle of the pepper ring and flatten to form a hamburger. Add your favorite grill seasoning and cheese to the top. We went with cheddar and McCormick's Bacon Molasses seasoning - PERFECT for burgers. What do you guys think? Have any go-to recipes that are light on the carbs and easy on this vegetable hating girl? omg YUM!!!! you guys are speaking my language... the lovely anti-inflammatory, health conscious cuisine when you aren't veggie-prone! haha! that's so how i am!! and this looks amazing!! my husband hasn't had a burger bun in... years! but we've never tried peppers, that is super creative!! and i bet it was delicious!! i will say i have used ezekiel english muffins as a bun [it's in the frozen section and grown from sprouted grains, somehow it's a whole different ballgame than traditional bread - i don't even know - but ezekiel is all we have these days for bread and it's very non-bloaty, and biblical somehow haha! :)] AND since i must have my pasta, jovial brand gluten free brown rice pasta is the bestttt. and to eat veggies, i just figure if i put enough garlic, italian seasoning, and cheese on just about anything, i'll be able to eat it. [sliced up squash in a pan with red sauce and tons of italian seasoning, garlic powder, a little himalayan salt, cheese and red sauce is AMAZING.] everything else can go in a smoothie!!! haha! Oh these look amazing! Amazing! I'm going to have to bookmark this recipe and do it when the weather decides if it wants to be nice grilling weather or still winter. Haha! Yaassss so happy to see this recipe on here! This is going in my meal plan for next week!! ohhhh these look so good! i love the idea of using peppers. i like to use portobello mushrooms as buns when i'm trying to eat less carbs or just because i love mushrooms, but they are messy lol. Wow these look so good! Just in time for grill season, too!